Last week I took a long weekend road trip up to Minneapolis for the 2014 BMW MOA International Rally. On my way up we road the Great River Road up through Wisconsin, which is a very scenic road following the Mississippi River. Overall I would highly recommend it as a (long) day right out there for anyone interested. There is some really fantastic shots. I took my GoPro along with me, but unfortunately I only turned it on after La Crosse so I didn't get the best of the ride on film. I will have to do that at another point. So this summer I hope to get Megan on the back of the motorcycle and do some trips. Part of this involves here getting some gear, but it also has involved her having some sort of "backrest" for the back of the bike to lean against. My bike doesn't have a ton of options for this, but after doing quite a bit of research this winter I opted to go with the Givi system. It was cheaper than the BMW system (and the case looks better) and it didn't involve me purchasing an entire new seat for the bike. 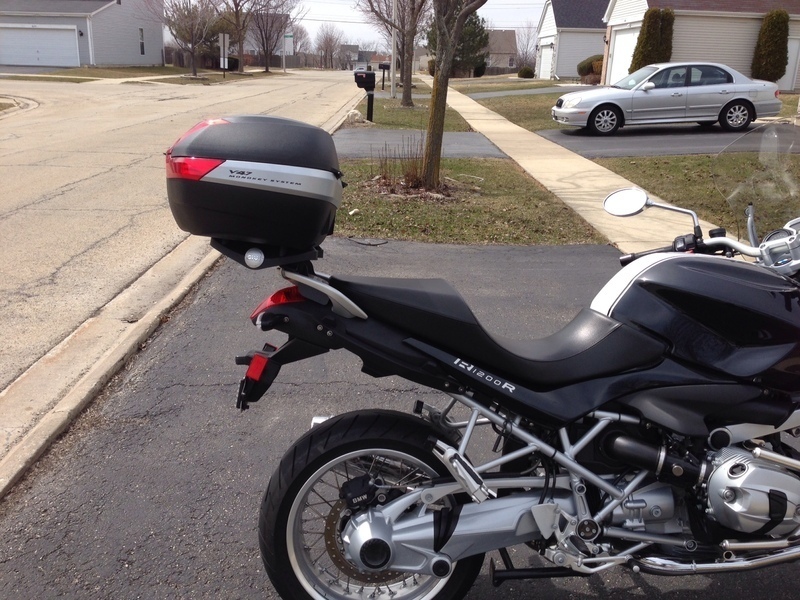 After getting the rear rack on the bike, I am not thrilled with how it looks, but it looks fine. It just detracts from the minimalism that I like on the bike. The Givi gear seems to be really well built. I just feel that the top plate they have is a bit thick and it unfortunately does not have any utility for strapping gear down when the case isn't on the bike. I may look into trying to fabricate a replacement aluminum plate which could be thinner, but we will see. Again, it doesn't look horrible. I can't deny the utility of the top case though. I used it riding to work last week and the 47l case can hold quite a lot. Last week I picked up some new LED lights for my motorcycle and installed the P3 lights for the tail end of my motorcycle. Installation over all was very easy and I spent more time running the wires than I did doing the actual installation. Here I took of the tail end of the bike and setup to run the controller from just under the seat. I ran the wiring along the left side of the bike following the existing breaklight wiring as closely as possible. Here you can see the wire coming out just under the the bottom left side of the rear fender where the existing license plate lighting wire runs from. I basically followed this wire all the way down. 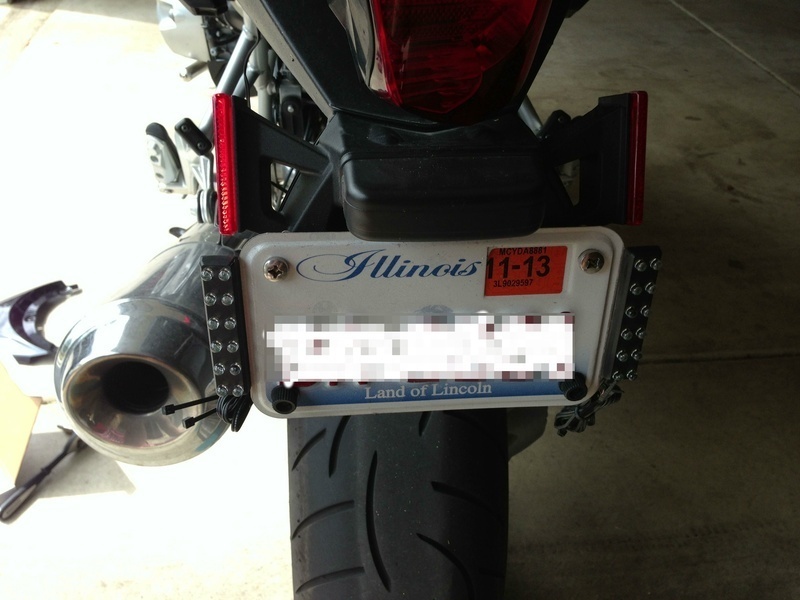 Here is a picture of the LED units mounted on either side of the license plate. The screws and brackets were mounted to the top holes of the license plate. Here is a closer look of the wiring as it runs down the side of the bike and how I tried to tuck it away behind the rear bracket. The controller was mounted to the rear frame piece under the seat with some zip ties and I wrapped all of the wires in cold shrink tape in the end.